I’m still using the first iPod I ever got. My wife gave me the 5th generation 30GB iPod with video. And yes, I did review this iPod back in 2007. So what? I’m reviewing it again. I love this iPod. I have not felt the urge to upgrade or replace it. It works as well as it did 5 years ago when I got it. The interface is simple and easy to use. It does one thing, and it does it well. 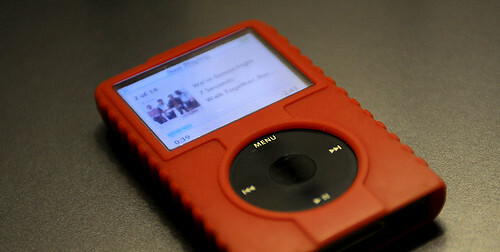 The iPod interface also requires you to look, or at least be able to feel around and guess where to push. Other players (with actual buttons) allow you to memorize where the buttons are and what they do. I could operate my Rio while driving and never take my eyes off the road. This seems to be a big concern with the iPhone as well, it will require visual attention to be able to use it. Maybe it’s because I’ve been using the old iPod interface for so long, but I feel much more at ease using it to navigate for music playing than I do for my iPhone. It’s all spin and click, no typing or swiping. I still on occasion have an issue with the iPod not turning off, but it happens seldom enough that it’s not really a bother. Battery life also seems a bit shorter than it used to be, but hey, it is 5 years old and has been used a lot. The battery does hold a charge, so that’s good. The only really bothersome thing is that at some point it got confused and started showing the wrong artwork for some of the files on it. So I’ll be listening to Sleep and it shows album cover art for Cat Power. I’ve gotten used to it. A restore might fix that, but I’ve never had the energy to do one. I don’t need apps, or wifi, or a camera, or anything except a music player, so as long as it holds out, I’ll keep using the 5th generation 30GB iPod for my automotive audio needs. Posted on Thursday, December 23rd, 2010 at 7:00 am. Subscribe to the comments feed. Both comments and pings are currently closed. Post on your own blog. I’m surprised your battery still holds a charge. I have the same iPod, and my battery gave up the ghost years ago. I agree and prefer the old UI for auto listening. I bought a refurbed Classic for that reason. I have a touch for the other fancy stuff, but when I want to listen to something, my Classic is the first iPod I reach for. I will be sad if they discontinue it. Good move buying a Classic… that was (and is) my contingency plan.